Visually, this is an extremely appealing film with excellent character designs (much less creepy than the first two films, in my opinion), extremely colorful backgrounds, and an incredibly smooth and polished appearance overall. The music by Heitor Pereira is impressive as well, composed with several different international instruments in mind that create a few subtle but appreciated layers along the way. 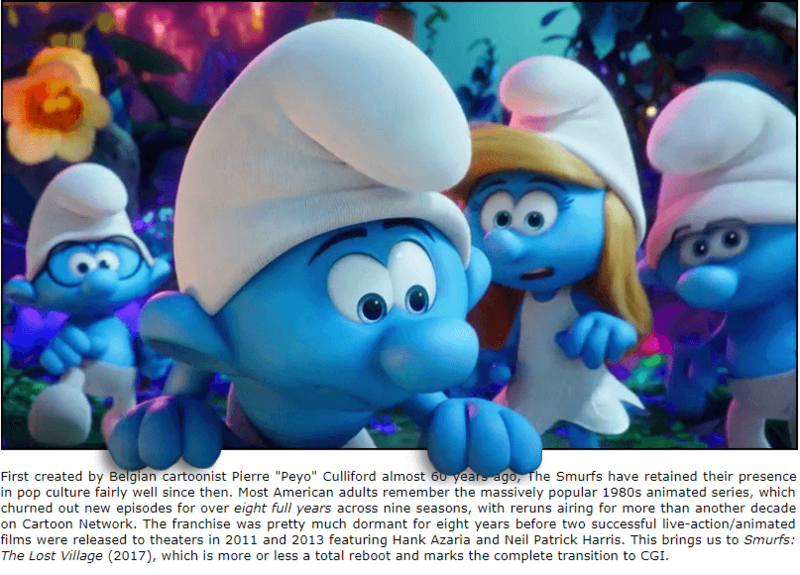 Unfortunately, that's where all the good news ends, because Smurfs: The Lost Village plays it painfully straight in the story department and takes very few chances for such a quick reboot. It's about as ambitious as your average 80s Saturday morning cartoon adventure; obviously larger in scope, but routinely limited by the paint-by-numbers script and a handful of uninspired celebrity voice acting choices. To the film's credit, it was obviously created with good intentions and should have a bit more staying power than recent studio productions like *gag* The Emoji Movie and direct-to-disc dreck such as Surf's Up 2: WaveMania (incidentally, previews for both are included on this Blu-ray). 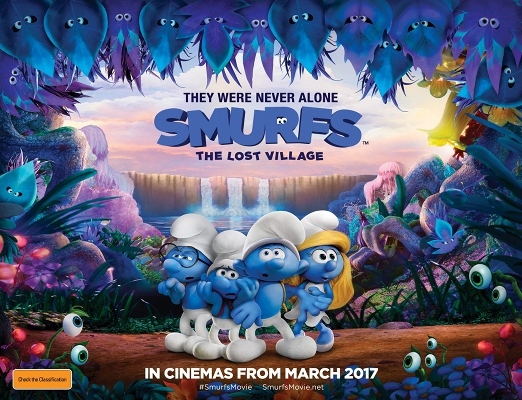 But that's obviously damning with faint praise: in almost every aspect other than the visual design and music, Smurfs: The Lost Village feels short-sighted and disposable, even though it's relatively strong box-office performance all but guarantees we'll get another installment in a year or two. The franchise's paper-thin foundation---one villain hunting down dozens of pint-sized heroes with incredibly specific abilities---has rarely shown its seams as strongly, and the "girl power" sentiment feels more pandering than earned. But like Sony's own Spider-Man film franchise, the oversaturation of reboots and remakes is the biggest culprit. Still, maybe I'm being too hard on a film that isn't packed with soon-dated pop culture references and wall-to-wall fart jokes. 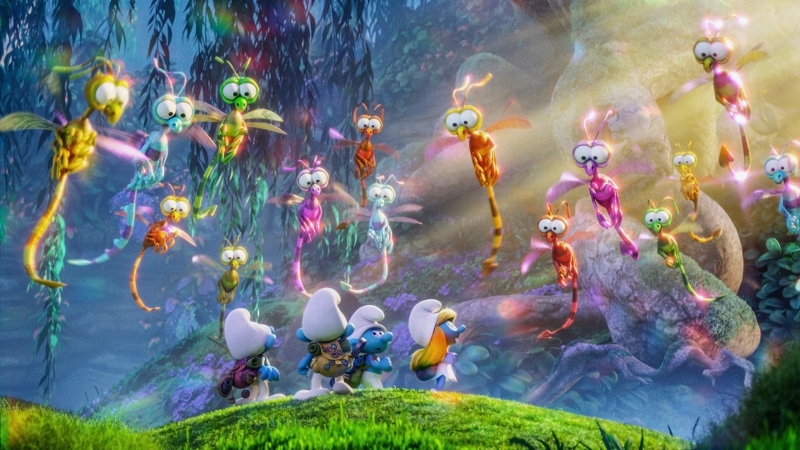 Smurfs: The Lost Village is harmless fun, all thing considered, but it's the kind of family movie that's obviously created with the kids in mind. 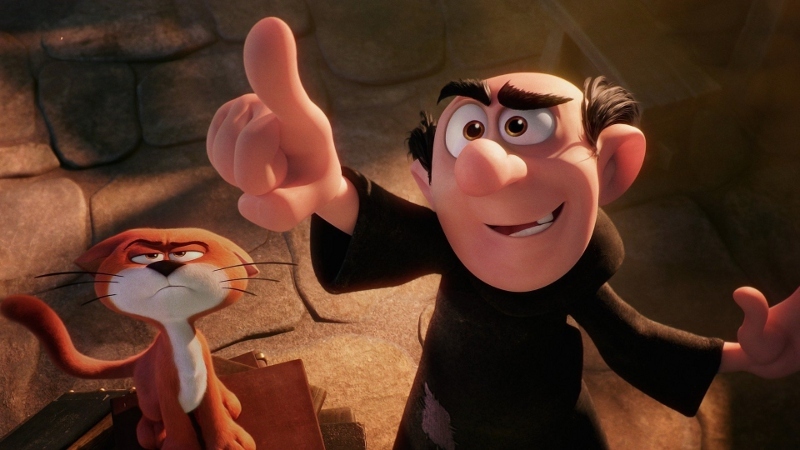 I had a tough time seeing past the film's obvious script-related shortcomings and easy slapstick humor---Gargamel is really toothless in this one, which strips away a lot of the danger---but anyone in their single-digits will likely give it an easy pass. Thankfully, Sony's Blu-ray offers a strong amount of support including a perfect A/V presentation and a surprising number of extras considering the quick turnaround time. Not surprisingly, this 1080p presentation of this all-digital production looks flawless from every angle: image detail is top-notch, color reproduction is looks evenly saturated and vivid, and textures are quite impressive from start to finish (an optional 4K UHD release is available as well, if you're up for it). There's a great amount of depth at times and absolutely no digital issues to speak of, including compression artifacts, edge enhancement, motion blurring and the like. It's all good news here and that's no surprise, given Sony's excellent treatment of new and catalog releases. Fans will be pleased for sure, as this is a reference-quality presentation that will delight viewers of all ages. Not to be outdone, the default DTS-HD Master Audio 5.1 mix is incredibly crisp and immersive, with excellent channel separation, crystal clear dialogue, plenty of booming low end during action sequences, and a respectable amount of surround activity along the way. Absolutely no defect or other issues to speak of here either, making this lossless audio presentation just as potent and impressive as the visuals. Plenty of alternate options are here as well: dubs are provided in French and Portuguese (DTS-HD Master Audio 5.1), Spanish (Dolby Digital 5.1), an English Descriptive Video Services track, plus optional subtitles in all four languages during the film and bonus features. The colorful interface replicates the front cover and poster artwork (seen below left), with clean navigation and smartly organized sub-menus for scene selection, audio/subtitle setup, and bonus features. This one-disc package arrives in a standard keepcase with an extremely bright and colorful slipcover, a Digital Copy code, and a coupon booklet. Lots of kid-friendly extras are included here, but not surprisingly there's very little depth. The most adult-oriented is an Audio Commentary with director Kelly Asbury, animation supervisor Alan Hawkins, and head of story Brandon Jeffords; together, they break down the usual departments (the story, cast, visual design, music, etc.) but it's not surprisingly a guarded and back-patting affair that probably won't win over anyone who didn't love the movie. On a related note is "Kids at Heart! The Making of Smurfs: The Lost Village" (9 minutes), essentially a condensed and less informative overview with more cast and crew members. 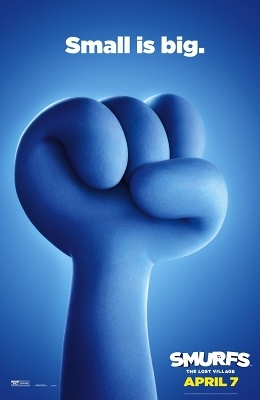 The film's soundtrack is also covered in "The Sound of the Smurfs" (4 minutes) and "Making You Will Always Find Me In Your Heart" (3 minutes) with composer Christopher Lennertz. Also here is a short collection of Deleted & Extended Scenes ("Smurfberry Blast", "Brainy's Experiment", "Bridge Escape", and "Gargamel's Lair", 8 minutes total), presented in digital animatic form with added music, voices, and sound effects. The lightweight but amusing skit "The Lost Auditions" (4 minutes) featuring a few voice actors auditioning for other roles. Similarly, "Baker Smurf's Mini Kitchen" (4 minutes) shows someone's hands whipping up a few miniature treats. Finally, the welcome "Draw Your Favorite Smurfs" (8 minutes) offers a quick lesson for aspiring artists of all ages. Awful extras I could only watch for about 20 seconds before dry-heaving: "Demi Lovato Meets Smurfette" (1 minute), "Lost Village Dance-Along" (4 minutes), "Smurfify Your Nails" (2 minutes), a Music Video for "I'm a Lady" by Meghan Trainor (3 minutes), and a Sneak Peek for The Emoji Movie (2 minutes). I have my limits, people. Despite the packaging's repeated claims that Smurfs: The Lost Village offers "fun for the whole family! "...nope, I barely chuckled more than a few times. This was obviously a film run by committee: it takes very few chances in the story department, many of the jokes just fall flat, and a lot of the voice acting is more than a little uninspired. That said, the visuals are first-rate and a clear step up from the live-action/animated hybrids from a few years ago, so most kids---and some parents, probably---will probably flip for the colorful characters, backgrounds, and effects. Sony's Blu-ray (no combo pack?) serves up a fantastic A/V presentation and a fairly substantial collection of extras mostly aimed at the younger crowd. Still, I can't recommend a movie this weak and sleep soundly. Rent It first.